The Train Station Network represents a real application as it is constructed for the metro in Santo Domingo (Dom. Rep.). Each switch represents a train station, exactly like in the real network. The original configurations of the Santo Domingo network have been applied to the devices to create a real switching environment considering network load and configuration complexity. 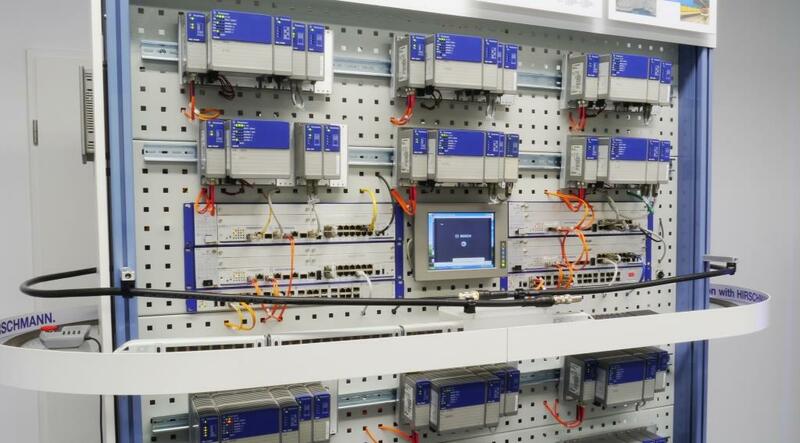 The system test department uses the setup to conduct tests, like software updates or multicast tests, to ensure compatibility with running live applications. The network is bases on OSPF (Open Shortest Path First), which is a dynamic routing protocol. Additionally DVMRP (Distance Vector Multicast Routing Protocol) is configured in order to facilitate the transport of IP multicast packets in the network. This is required due to one of the purposes the network was designed for: Security guards using walkie-talkies to communicate over the IP network. To simulate a multicast stream, there is a video camera installed in the head coach of the model train. It constantly transmits a video signal wirelessly over a leaky cable (and wireless receiver) to a video converter, from which it is forwarded into the network. An end device, such as a computer, is able to receive and display the stream. The switches used in the application are the modular PowerMICE switches. Its main advantage is the high flexibility due to swappable modules. The Hirschmann product portfolio involves a wide range of different media modules, which cover all essential demands. The user is able to customize switches for his individual application. Upon the modularity it features extensive layer 2 and layer 3 functions.